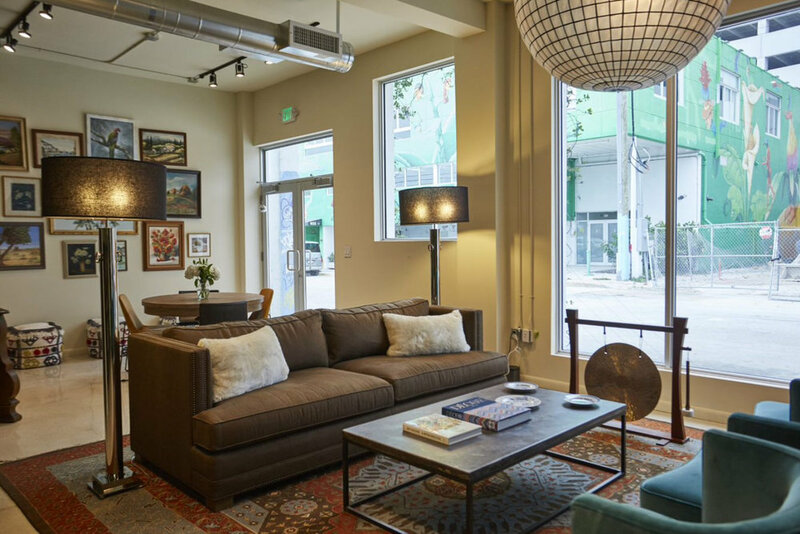 Since Quinn Miami is a creative working studio, it felt natural to alight in Wynwood, Miami’s Art District. We are grateful to Joe Furst at Goldman Properties for carving out a storefront that extends to the communal backyard. Sometimes people assume we are a store and come in to shop our art and objects. One day, we might just start selling the stuff – a good excuse to buy more. We call it The Storefront. Objects and books fill the street lounge. A view of the street lounge looking toward the wall of art. Midcentury ocean-blue chairs: a nod to the retro hotels that dot the Miami coastline. We live in hope that the serenity of this Buddha will rub off on us. Friend and architect David Abelow created our zig-zag offices. Odds-and-ends make our privacy rooms feel cozy. The back of the Storefront. ...and this crazy-long dining-room table. A teaching Buddha. Bring it on. Pink skies, a cyclist, a touch of street art pretty much summarizes the good life in Wynwood.